George Walford: Is Cheaper Better? Smith (Ken) Free is Cheaper, John Ball Press, May Hill, Gloucester. Cloth bound, pp 259, £12.95. Some accept modern society, some support it, others feel they have had it thrust upon them. Ken Smith belongs to the last group, and he fights back. His attack opens on the first page, with the charge that never before “has there been such a feeling of unnecessary suffering as in their dying years of the Twentieth Century,” and the pressure hardly relaxes; near the end the local council’s imposition of rates on the Whiteways colony is likened to the German Army’s treatment of the Jews in Warsaw. Dismissing the schemes of left and right, he puts his own proposals in highly general terms; a moneyless society in which people control their own lives and the economy aims at satisfying needs. (pp.225-6) This is not called socialism (that term does not appear in the index and the book contains no endorsement of any party), but it dearly belongs out towards the anarcho- socialist extreme of the politico-ideological spectrum. The general theme is familiar enough, but the book is written with a sparky, quirky individuality that keeps up the interest, and one refreshing departure from the alternative orthodoxy appears right at the start; he realises that we are all in it together. Insecurity affects both capitalist and worker, the sea is polluted for rich and poor alike, and we all have to breathe the same foul air. He blames not a class but -the market system. Free is Cheaper maintains the high standard of freshness and vigour set by its title; within an area previously surveyed it breaks new ground. Ken Smith takes his place firmly among the prophets of doom and, like the others from Jeremiah onwards, has no difficulty in finding authorities to support his predictions. He leaves almost unmentioned the great amount of material pointing in the opposite direction; all the solid work whose authors see no reason to question the success and continuance of capitalism. This book does not ask how people with similar information at their disposal, and living under similar conditions, come to take up radically different positions. It does not try to explain why Ken Smith came to adopt these views when most of his coevals, colleagues and compatriots did not. It was, he tells us, when the peasants were pushed off the land by the developing market economy that things started to go wrong, both in Europe and in the colonies: “When you came, we had the land and you had the bibles; when you left, you had the land and we had the bibles.” The change was from wealth-creation to money-making, and his title encapsulates one of the themes; that even within the present system, for many goods of general consumption – water, sewerage and gas are instanced – it would be cheaper to supply them without charging separately for each item than to maintain the top-heavy, rapacious and ever-growing bureaucracy (governmental or commercial) inseparable from the profit system. (In one place the argument seems to get out of control; p. 61 gives, apparently with approval, a quotation to the effect that it was the very cheapness of American public lands that led to their destruction by carelessly exploitative farming). It is known that there is a direct connection between the functioning of the liver and the ovaries; the role of the liver being to inactivate the excess oestrogens which the ovaries throw into the blood stream. Fatty degeneration of the liver and the tendency to cirrhosis are, as we have previously seen, some of the characteristic results of protein deficiency, and are very common in the Far East and in certain tropical areas of other continents. When degeneration of the liver occurs it begins to operate less efficiently and is less effective at its job of inactivating excess oestrogens. The result is a marked increase in the woman’s reproductive capacity… the supporting facts are at hand and we can risk a collision with Victorian prejudices and neo-Malthusian theories. It is high time to challenge a point of view which, inspired by economic or political interest, regards as a natural human condition, what is in fact the result of social factors. That comes from Josue de Castro’s Geography of Hunger (London: Victor Gollancz Ltd. 1952, p. 140). It blames only “social factors” for malnutrition, not specifically the market economy. On looking into de Castro’s book for further evidence in support of Smith’s theory the results are not what might have been expected. Saying that diet has become less healthy as society has developed, de Castro locates the origin, of the trouble much earlier than Smith would have it; not at the entry of the market economy but at the beginning of civilisation; greater numbers and a more settled way of life made it more difficult to provide the variety of foods available to the scattered and wide-ranging hunter-gatherers. (pp. 36, 37) Smith believes that peasant farmers producing their own food enjoy a healthy variety; de Castro shows the contrary; peasant farming tends towards monoculture, the Chinese being the outstanding example; they live almost entirely on rice in the south, and on sorghum and wheat in the north. In New Guinea, another country not taken over by the market economy when de Castro wrote, no less than eight out of ten children died of malnutrition before reaching puberty. (p. 34) Going directly against Smith, he tells us: “It is precisely in those areas of the world that are least developed that this kind of hunger extorts its highest tribute.” (p. 34) The least developed areas are those least affected by the market, not those which have been integrated into it as sources of materials. Smith would ascribe the increase in population to protein deficiency, but de Castro says that if by more extensive use of DDT (he is writing in 1952) malaria could be ended as yellow fever has been, 600 million more hands would be available to produce more food; Smith’s chosen source goes against him in maintaining that disease control is a significant factor contributing to the increase. The world is a big place and it is up to each of us to fight our own corner as well as caring for the whole. 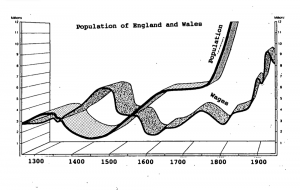 Ken Smith very properly devotes much of his attention to Britain, and he claims to have pinned down pretty accurately the beginning of the problem here: “living standards plunged from the time of Henry VIII’s Accession.” (p. 14) He gives the graph reproduced below to show population going up as wages (and therefore protein intake) go down. 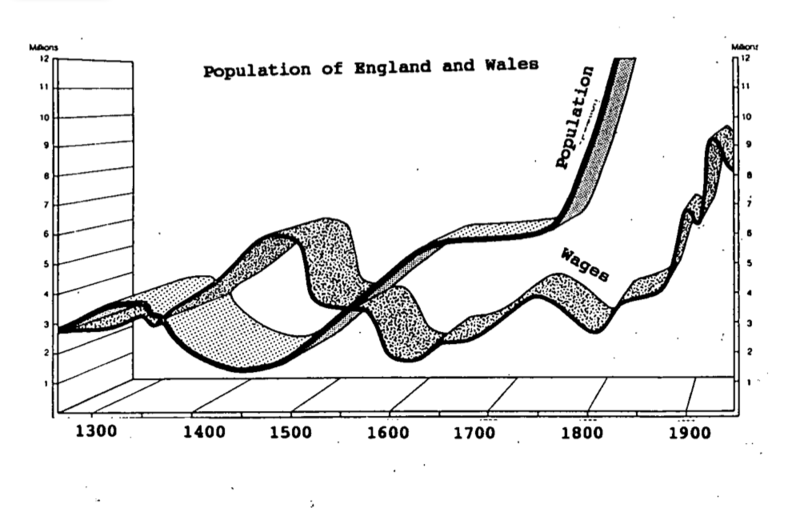 Surprisingly, the most striking feature of this graph is a sharp upturn in population around 1750, with no fall in wages that comes anywhere near corresponding to it. The early part however, from 1300 to 1500, supports the argument splendidly, wages falling and population rising, and then both trends reversing together. Everything goes just as it should; here, at least, Ken Smith has made his point. But wait a second. Fourteenth century? wasn’t there something special going on then, something that affected wage rates and population figures? Indeed there was: the Black Death. This ran, with respites and recurrences, from 1347 to 1400. In different areas it killed from one-eighth to two-thirds of the population, probably averaging around one-third; in 1400 the population of England was perhaps half what it had been 100 years earlier. Among the more lasting consequences of the Black Death was a general rise in wages. (Encyclopedia Britannica 1963, my emphasis). Ken Smith opens his first chapter by saying: “Five hundred years ago an English building worker could earn the price of a steak or lamb chop, a housebrick or rooftile in as little or even less time at work than he can today.” Five hundred years ago places us in 1489, in the aftermath of an epidemic which (according to the Britannica), took a heavier toll than has been taken by any other plague or war up to 1963, an epidemic producing a rise in wages. Ken Smith has selected, as his baseline for comparisons, a period when conditions were even more abnormal than they usually are, and it would have been nice of him to mention this. Smith’s chosen source of information on poverty and malnutrition shows that they were not introduced by the market society; they have been around since the beginning of civilisation and even before that. De Castro mentions primitives (his term) in Africa and South America driven to eat clay in an attempt to make up for a shortage of iron in the local soil. De Castro also accepts that disease control has had much to do with the recent explosive increase in population, and disease control has been one achievement of the market society. Certainly this society has not overcome poverty and malnutrition but, as Smith recognises, it has shown itself capable, so far as technology goes, of producing the supplies needed for five thousand million people to lead healthy and enjoyable lives, and may be able to support even larger numbers. Former societies, and among them the peasant cultivation Ken Smith favours, were quite unable to do this even for their smaller populations, and there is no direct evidence that a system of production excluding the profit motive would be capable of it. The examples of communal activity Smith cites are all beside the point since they operate within a profit- driven society. The market society has committed greater crimes against humanity than any previous system; the size of these is an indication of its power and, consequently, of the benefits it is capable of providing. The trouble with it is not failure but unbounded, unbalanced, uncontrolled success, the appearance of huge numbers of people without proper food being one instance of this. It has to be brought under control if we are to survive, but to do away with it would be like cutting one’s throat to cure a headache. from Ideological Commentary 41, September 1989.